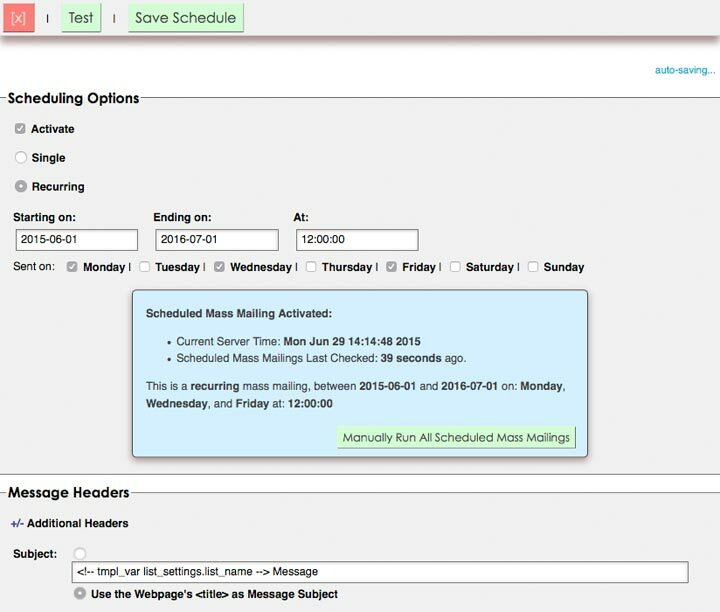 Dada Mail supports both single and recurring scheduled mass mailings. Author your message, and when you're ready, click the button labeled, Save as: Schedule. Scheduled Mass Mailings can also be created from Stationery or from an already existing Draft Message. Your schedule will then be saved, the screen will refresh, and options to activate the schedule, as well as options to set the type, date,time of the new schedule will be shown. Check the option when you're ready to have your scheduled mailing go live. If a scheduled mass mailing is not activated, it will not be sent out, but will be available for further editing. A single scheduled mass mailing will be sent only once sometime in the future. Click the textbox next to the label, Schedule For: to set the date and time you would like the schedule to go out. A calendar widget should pop up, to facilitate setting up the scheduled date and time. Once everything is all set, click the button labeled, Save Schedule. A recurring mass mailing will be sent repeatedly, based on the options you've set. You will have to set a start date, an end date, a time in the day the schedule should go out, and what days of the week you would like the message to be sent out on. This is your starting date. Select the year, month and day you would like your scheduled mass mailings to start. This is your ending date. Select the year, month and day you would like your scheduled mass mailings to end. This is the hour, minute, and second your mass mailing will go out at. Select the days in the week you would like your mass mailing to be sent out on. Below the options to set the details of the schedule, will be a box showing you the details of the schedule you're setting. This box will also show the current server time as well as the last time the mass mailing schedules will last checked. This box will also shown any reports of problems with the paramaters of your scheduled mass mailing. Once a scheduled mass mailing is saved, you may view and edit it in the list control panel under, Mass Mailing - Drafts/Stationery/Schedules. Click the, Schedules tab to see all your schedules. Click the Subject of your schedule, or click the button labeled, Edit... to further edit your scheduled mass mailing. Single Scheduled Mass Mailings do not have any unique system requirements.